Black Gate » Articles » Goth Chick News: Coffins as Marketing Material? You Betcha! Goth Chick News: Coffins as Marketing Material? You Betcha! I’m often asked how one goes about getting their stories published — or even talked about — in Black Gate. This generally leads to a somewhat uncomfortable conversation about the various viable options for attracting the attention of our Editor and Chief (aka “The Big Cheese”) John O’Neill – beyond never, ever forgetting to capitalize his various monikers when corresponding. To get mentioned in Goth Chick News, the criteria for entre is less strenuous, if somewhat more narrow: do something uniquely creepy, but never gratuitously violent (anyone can throw blood around, after all). If you are going to tell me a story, make it a good one. Because there’s nothing worse than willingly following someone into a tale, only to be “shaken awake” by meandering plots, vampires who sparkle or, of course, a pointlessly high gross-out factor. Or you can just deliver me a coffin – every girl has her weakness. 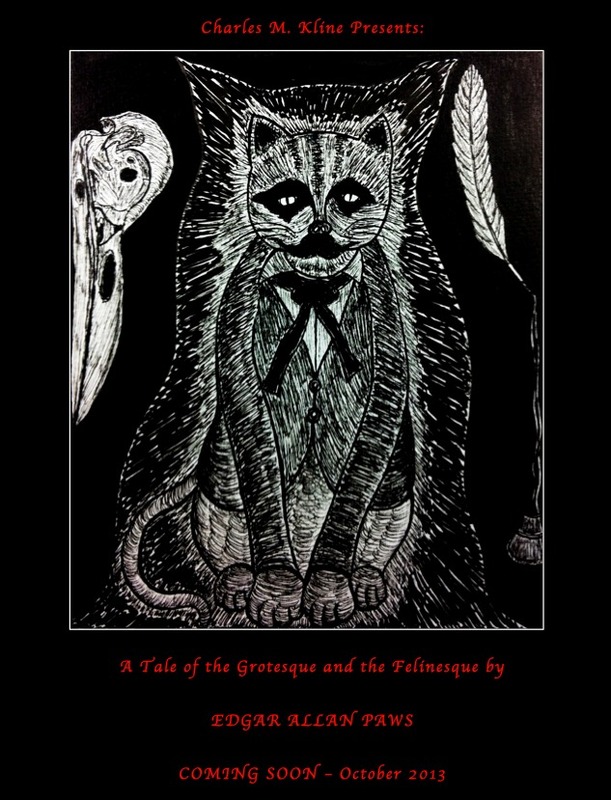 That’s precisely what author Charles M. Kline chose to do in promoting his upcoming ingenious title, Tales of the Grotesque and Felinesque by Edgar Allen Paws. 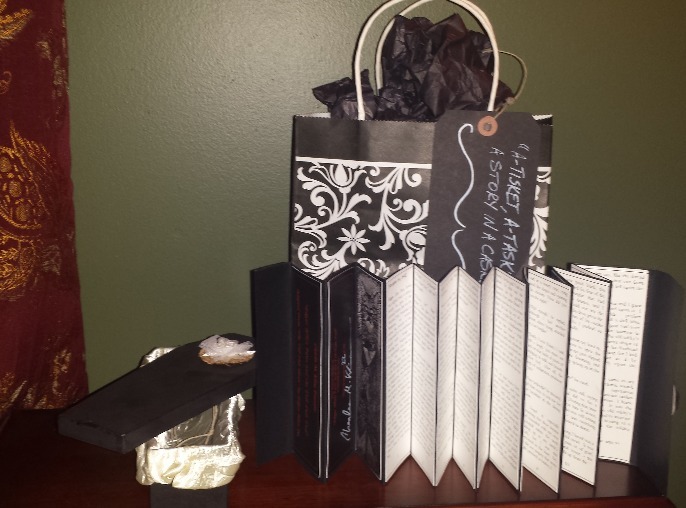 The package pictured here came to me through a series of handoffs in the Black Gate staff, starting with Sarah Avery, who received it at the World Fantasy Convention. There was a tag hanging from the outside of the lovely gift bag which read, “A tisket, a tasket, a story in a casket,” causing the hands it passed through to be too creeped out to open it. So by the time it reached me, the curiosity alone almost did me in. Check, on the “uniquely creepy” criterion. Each small page of the beautifully constructed accordion scroll contained a page of the story, complete with illustrations. 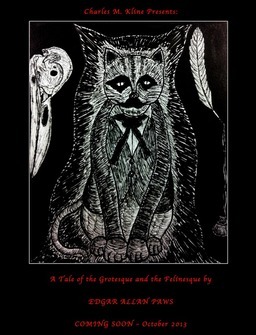 This version of Poe’s tale is populated with animals (cats, mainly) and is… well… awesome. 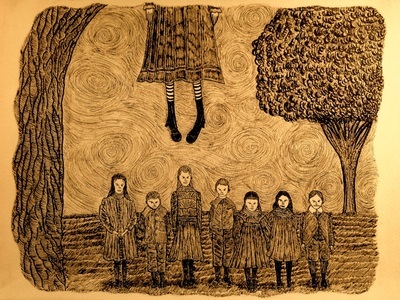 Imagine Edward Gorey, Charles Addams, and Poe all getting together to write a children’s book. Charles M. Kline only recently discovered wolves had raised him until the age of two, and that his “real parents” found him while camping in western Montana. 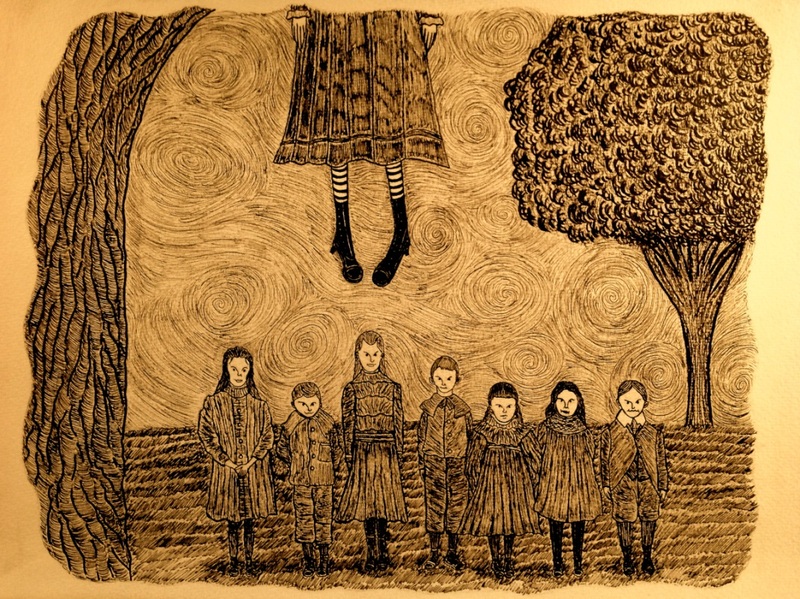 It goes on to tease Kline’s next venture Mother Noose Nursery Crimes – Coming Soon. Though you won’t get the same coffin-box experience, you can (and absolutely should) check out a PDF version of The Tell-Tale Tail here. Have a comment or a coffin you’d like to share? Post it here or drop a line to sue@blackgate.com – arrangements will be made. I got to have the delightful moment of saying, as I parted company with the author, “Thank you for the lovely coffin. It is by far the loveliest coffin anyone has ever given me,” which amused us both mightily. And then I rushed off to show it to John and urge him to put it in your hands. I’m very glad you did, Sarah. Although, as Sue noted, I was too creeped out to open the coffin myself!